Known in Roman mythology as Ulysses. Greek hero; king of Ithaca; son of Laertes (some say of Sisyphus) and Anticlea, husband of Pênelopê. A leading hero of the Trojan War, who proposed the idea of the Trojan Horse. 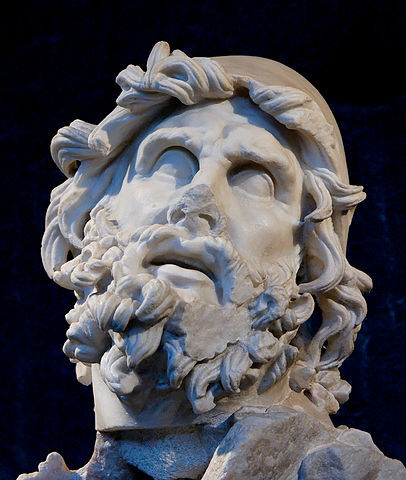 In contrast to the physical strength of Hêraclês, Odysseus’s heroism was a result of his wit and cunning. The exploits of Odysseus during the Trojan War, and his ten year long circuitous return thereafter to Ithaca and his wife Pênelopê, are detailed in The Iliad and The Odyssey of the greatest of Greek poets, Homêr (c. 850 b.c.e.) The story of Odysseus includes such well-known tales as the Trojan Horse; the narcotized Lotus-Eaters; the Blinding of Polyphêmos; the sorceress Kirkê (Circe), who turned his men into swine; the Song of the Sirens; Scylla and Charybdis; and the Suitors of Pênelopê. The following is a brief paraphrase of one of his adventures: his capture by, and escape from, the Cyclops Polyphêmos. Odysseus and his men had stopped at the island where Polyphêmos lived, hoping to restock their boat with provisions. They explored the island and discovered a large cave containing a great store of food. Polyphêmos presently returned to his cave, driving in his herd of sheep, and blocking the entrance behind him with a huge stone. While milking his sheep, he noticed the intruders. Odysseus politely asked Polyphêmos for hospitality in the name of the gods. Polyphêmos rather impolitely responded by seizing two of his men and devouring them, then stretching out on the floor of the cave and falling asleep. Though tempted to kill the giant as he slept, Odysseus realized the futility of such a course of action, since the stone blocking the entrance to the cave was far to large to be moved by men. The next morning, Polyphêmos arose, devoured two more of the men, rolled away the stone, and set out to pasture his flock, replacing the stone behind him. While he was gone, Odysseus and his men discovered a massive bar of wood which Polyphêmos used for a staff. They sharpened one end and concealed it under the straw on the floor of the cave. When Polyphêmos returned, he devoured two more men. After his dinner, Odysseus approached him and offered him a bowl of wine, which he accepted, and, thoroughly enjoying it, asked for more. Odysseus fulfilled his request several times. Polyphêmos was so pleased with the wine, that he promised Odysseus that he would be the last to be devoured, and asked his name. Odysseus replied “I am No-man” (in Greek “oud-eis,” a pun on the name Odysseus). Polyphêmos sank into a drunken stupor. Odysseus and his men heated the end of the sharpened stake in the fire until it glowed red hot, then thrust it into the giant’s single eye, and concealed themselves in the cave. The monster’s cries attracted the attention of the other Cyclopes living on the island, and they came to his cave inquiring what all the noise was about. Polyphêmos answered, “I have been blinded by No-man.” His friends responded that, if no man did it, it must have been the gods who did it, so Polyphêmos would simply have to bear his suffering. They returned to their own caves. The next morning, Polyphêmos rolled away the stone and stood outside the entrance, meaning to feel all who exited to assure that the men did not escape. Odysseus and his men strapped themselves to the undersides of the sheep and so escaped. Once outside the cave, they drove the sheep to their boat and set sail.